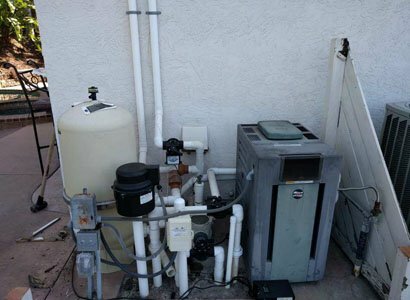 When we were contacted by this Scripps Ranch homeowner, there was a problem with the pool pump. When Glenn arrived to look at the pool equipment, he met with the customer to go over the specific pool pump repair. After they spoke more about the pool equipment, this Scripps Ranch pool owner decide to upgrade the pool equipment. They chose to have us install a new Pentair variable speed pool pump and new EasyTouch pool automation. They were excited to have the pool and spa operated from their smartphones or tablet. They were also happy to know that the new Pentair pool pump was going to reduce their energy consumption and run quieter. This, in turn, will lower this Scripps Ranch homes electric bill. 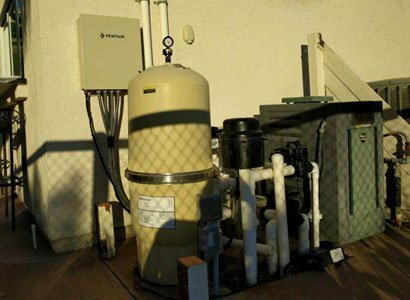 Installing the Pentair variable speed pool pump for this specific Scripps Ranch swimming pool and spa was a no brainer. This is because we also installed a new Pentair EasyTouch pool automation controller. 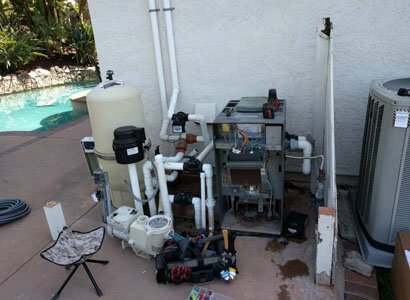 Pentair pool pumps and pool controllers work together flawlessly and are the best performing variable speed pool pump that we have installed here in San Diego County. All variable speed, energy efficient pool pumps installed are programmed properly based on the specific pool and spa. Pentair variable speed pumps are easy to control independently though this customer will be using their smartphone or tablet to operate the swimming pool. All access with a tap on the screen. This Scripps Ranch swimming pool owner will now have a pool pump that is very quiet and runs extremely efficient. By properly programming the variable speed pool pump you can maximize the pumps operating schedules. Six to ten hours on low speed, one or two hours for the in-floor pool vacuum to work and ramp it up when running your solar or spa jets or bubbles. When replacing your pool pump, Pentair variable speed pumps are the way to go unless you have a different brand of pool automation. 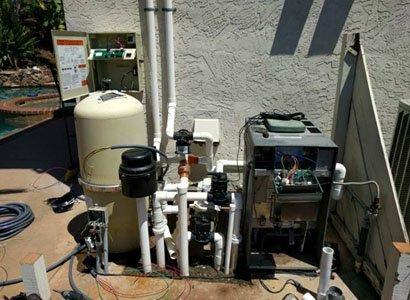 When this Scripps Ranch swimming pool owner realized how much easier it would be for him and his family members to have pool automation, it was an easy decision. No longer will they have to worry about walking outside in the dark and turning valves that they are unsure about. With this Pentair EasyTouch pool automation, everything is at the touch of the smartphone’s screen. Turning on the spa or hot tub with just one tap and when finished one more tap to turn it off. Turning on pool lights and water features are just as easy. Now everyone in the family can have full access to the swimming pool and spa without worrying about messing something up. Pentair EasyTouch was the perfect choice for this homeowner as it will also provide them with the ability to add additional features to the pool automation such as the landscape lighting. By having additional sources to add functionality gives you a much better outdoor experience. More fun and ease when enjoying this Scripps Ranch swimming pool and spa with family and friends. When it comes to pool automation, the Pentair EasyTouch is the way to go.They also carry lower end versions including the EasyTouch Lite and more high-end versions like the Pentair IntelliTouch. This pool pump installation and pool automation installation takes just about one day to complete with no downtime to the swimming pool or spa. If you live in Scripps Ranch or any other area of San Diego and our considering pool automation or a new energy-efficient pool pump, give us a call or fill out our contact form. I hired Pro Touch to install a new variable speed pump, some actuated valves, automation control system and a spa light. They had all the parts in stock and completed the job the next day. Incredible service. The quality of work is outstanding. All at a fair price. I will not hesitate to call them again and will call for any of my pool needs. Don’t risk it. Call Pro Touch. Very impressed.